The meeting was organized by a local university committee and 205 delegates from 35 countries took part. European participation was low due to the economic crisis experienced by national air lines. During the conference, the AIPEA medals were awarded to Gerhard Lagaly and Tom Pinnavaia. 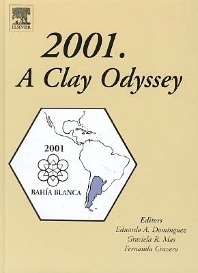 This volume of the Conference Proceedings contains 85 out of a total of 235 oral presentations and posters presented at the following symposia: Teaching Clay Mineralogy, Clays in Hydrothermal Deposits, Clays in Ceramics, Clays in Petroleum Exploration and Production, Clay Barriers, and Waste Management, as well as in the following general sessions of the Conference: Clays in Geology, Clay Minerals and Environment, Soil Mineralogy, Methods, Crystal Chemistry Structure and Synthesis, and Clays in Industry. (I.R. Wilson, H.H. Murray et al.). Demonstration of the existence of subcritical growth cracks in sintered kaolin (C. Xavier, P.K. Kiyohara, P. Souza Santos). Geology and physical properties of palygorskite from central China and southeastern United States (H. Zhou, H.H. Murray). V. Mineral Structure and Investigational Methods. a) Crystal chemistry. Distribution and characterization of forms of Fe and Al in particle-size fractions of an Entic Haplustoll by selective dissolution techniques, X-ray powder diffraction and Mössbauer spectroscopy (S.G. Acebal, M.E. Aguirre et al.). Thermal transformation of synthetic bayerite and nordstrandite as studied by electron-optical methods (M.L.P. Antunes, H. Souza Santos). Proton binding at clay surfaces in aqueous media (M.J. Avena, M.M. Mariscal, C.P. De Pauli). Hydrothermal transformation of kaolinite into 2:1 expandible minerals (M. Bentabol, M.D. Ruiz Cruz et al.). Synthesis and characterization of novel inorganic/organic hybrid materials prepared from layered double hydroxides (G.C.G. Caravaggio, A. Moser, C.D.C. Detellier). EPR characterisation of iron in various clay minerals: montmorillonites and layered double hydroxides (F. Dijoux, B. Deroide, D. Tichit). Synchrotron x-ray study of hydration dynamics in the synthetic swelling clay Na-fluorohectorite (E. DiMasi, J.O. Fossum, G.J. da Silva). Experimental weathering of biotite, muscovite and vermiculite: a Mössbauer spectroscopy study (E.A. Ferrow). Syntheses of smectite-analogue/coumarin composites (K. Fujii, S. Hayashi). Thermogravimetric analysis-mass spectrometry (TGA-MS) of hydrotalcites containing CO32-, NO3-, Cl-, SO42- or ClO4-. (J.T. Kloprogge, J. Kristóf, R.L. Frost). Spectroscopic analysis and X-ray diffraction of zinnwaldite (J.T. Kloprogge, S. van der Gaast et al.). Clay mineralogy and tensile strength of different soils from the southwestern Buenos Aires Province, Argentina (M. Del P. Moralejo, O.E. Soulages et al.). Molecular and particulate organisation in dye-clay films prepared by the Langmuir-Blodgett method (R. Ras, B. Van Duffel et al.). Si-Al-Mg and Si-Al-Zn montmorillonite: synthesis and characterization by EXAFS and quantitative 27Al MAS-MNR (M. Reinholdt, J. Miehé-Brendlé et al.). Electron optical study of star shaped gibbsite microcrystals (H. Souza Santos, P. Souza Santos, P.K. Kiyohara). A new method for the preparation of microcrystals of boehmite (P. Souza Santos, H. Souza Santos, P.K. Kiyohara). Studies of synthetic kaolinites containing copper and zinc. (G. Christidis, S. Kosiari, E. Petavratzi). Synthesis and characterization of copper-loaded Titania pillared clays (Z. Ding, R.L. Frost et al.). Synthesis and characterization of SiO2 - Cr2O3 pillared montmorillonites (E.M. Farfán-Torres, A.G. Mercado et al.). Castor, cottonseed, and soybean oil bleaching by activated bentonites (E.L. Foletto, C. Volzone et al.). OH-Al complexes on kaolinite surface and their effect on suspension properties (L.B. Garrido, C. Volzone). Remotion of chromium from water by treated altered-tuffaceous materials (A. Hülsken, D. Hall Gómez et al.). Clay iron oxide magnetic composites for the adsorptions of contaminants in water (L.C.A. Oliveira, R.M. Lago et al.). Thermal decomposition of layered Co-Al hydrotalcite: an in situ study (J. Pérez Ramírez, G. Mul et al.). Some structural properties of an Al-PILC influenced by grinding the starting montmorillonitic clay (M. Sergio, S. Cardozo et al.). Synthesis and characterization of pillared clays from Argentinean bentonites (C. Solar, E. Fernández et al.). Influence of the smectite type on the basal spacing after polyhydroxy-aluminum pillaring in some Brazilian and Argentinian clays (A.C. Vieira Coelho, P. Souza Santos et al. ).